This year, Kaspersky had to show white paw. The Russian publisher's products are now banned from the American administrations following a government decision. The latter suspects that the publisher is under the influence of the Kremlin. In recent weeks, Kaspersky has redoubled its efforts in terms of communication to restore its image. It remains to be seen whether this episodic story from House of Cards will have any impact on the sales of its security solutions. 2017 was also the year Kaspersky chose to unveil its free antivirus. It was therefore a natural decision to add it to our comparison of the best free antivirus software. The Kaspersky Free installer is a very lightweight download tool that will retrieve online the files needed to install the program. It is therefore necessary that the machine on which you want to install Kaspersky Free has an Internet connection. On its website the publisher does not offer an offline installer for the moment. 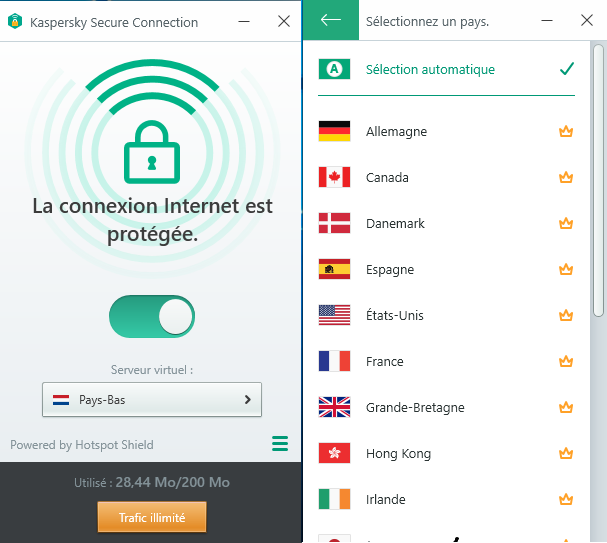 In addition to Kasperky Free, the installer also includes Kaspersky Secure Connection, a VPN service offered in partnership with Hotspot Shield. At the first launch, the software will ask you to open a free user account on the publisher's website. It is possible to bypass this registration and use all the features of the free version of the software by simply clicking on the "back" arrow. The interface of Kaspersky Free looks like the one of the paid version of Kaspersky Internet Security. On the Home screen, only two : scanning and updating are active. All other functions in the paid version are inactive. Everything is done to encourage the user to upgrade to the higher version of the product that has taken second place in our ranking of the best paid antivirus products of 2018. 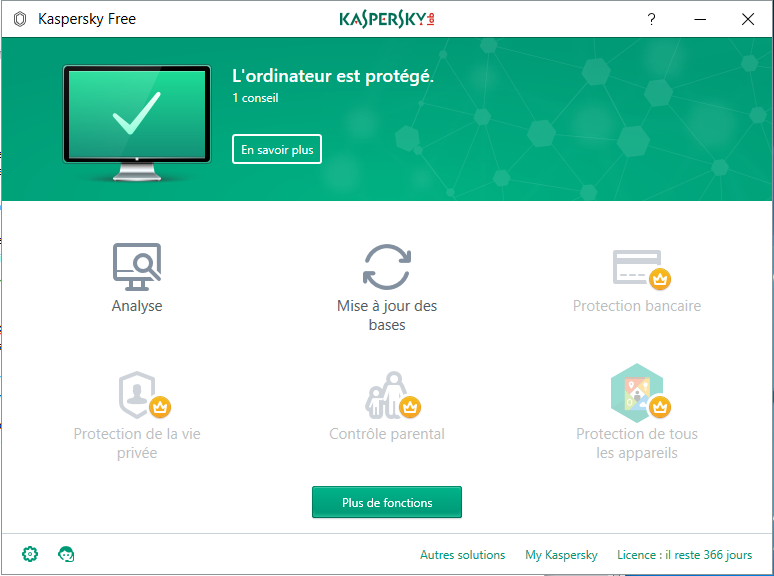 Concerning the navigation in the settings, if you have already used a Kasperksy antivirus: nothing changes, except the impossibility to access some functions only available in the paid versions. The user has a main pane accessible from the "settings" icon. This pane makes it easy to navigate through and adjust advanced settings. The handling and configuration remain simple but a good graphic redesign would not hurt the Kasperky Free interface. Let's now look at the performance of free antivirus software. What are the performances of Kaspersky Free? Kaspersky Free is a true antivirus that protects your machine in real time. Antivirus is presented as being able to scan internet traffic, files manipulated on the machine, instant messaging software and your mail to block malicious objects. Is that really the case? Suspicious files have automatically been detected during their manipulation by the antivirus software, which eliminates most of them on the spot. The others are subject to human verification, this means that it is the user who decides what action to take (delete the file, repair it, add it to the exclusions...). There's no need to say, the antivirus is reactive. Faced with such zeal, we decided to launch a contextual analysis on a file containing different types of threats, including ransomware, worms, Trojans and spyware of all kinds. The antivirus took just under 45 minutes to detect all malicious objects. The good point is that even if the analysis engine fully exploits the machine's resources, the machine is not slowed down. You will therefore be able to continue working on your device while scanning your PC. Of course, this will also depend on the degree of infection of your device. The software allows a total of 4 types of analyses (complete, contextual or customized, fast, external devices): from classic to classic. We decide to perform a complete analysis to remove all malicious objects scattered on the machine. All suspicious objects were again detected and treated by the antivirus software, which was a little long at the end of the analysis. Nothing very bad. Anyway, as far as its use of system resources is concerned, Kaspersky Free is doing very well. As mentioned above, Kaspersky Free also offers a VPN solution. 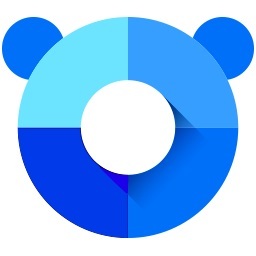 Be careful, in its free version, this VPN only offers 200 MB per day. The other defect is that it does not allow you to choose your country of connection. However, you can increase the daily data volume (up to 300 MB) by opening a free My Kaspersky account. With 300 MB per day, you won't go very far, especially if you plan to use this VPN to share files in Peer-to-peer mode. As for download speed, don't expect high performance. Indeed, the speed of our connection has been divided by 4. In the end, is Kaspersky Free a good antivirus? There is no doubt that Kaspersky Free is a good free security solution. The antivirus software embeds the bare minimum to guarantee the security of the machine on which it is installed, and it does it well. The software has been very responsive to different types of threats and all this without monopolizing the system's resources. It is intended for all types of users and can be configured as desired. The only problem is the integrated VPN service, which remains very limited in its free version. A detail that does not prevent the free edition of Kaspersky Free from being at the top of the ranking of the best free security solutions for PCs.